"Daa da da daaaaaaaa da da daaaaaa!" blares from the TV in the recreation room. It’s no surprise for anyone who lived in the Neopian Pound, to find a little skunk Kyrii sitting in front of the TV today. He had planned this moment for 2 weeks! Neopian Ned, as everyone tended to call him, had the chance to watch his favorite movie in the whole wide world…‘Neopian Malone and the Sakhmet of Doom’! “Isn’t Neopian Malone the greatest! ?” Neopian Ned exclaimed as he watched his hero dodge yet another catastrophe. Oh how he wished he could have an adventure! All too soon, the movie had ended and it was time for the pets to head to bed. Neopian Ned went back to his room and got ready to go to sleep. While he was waiting for his friend, Joey, to come back to the room, he started to daydream about being in an exciting adventure! Wait, can he daydream at night? 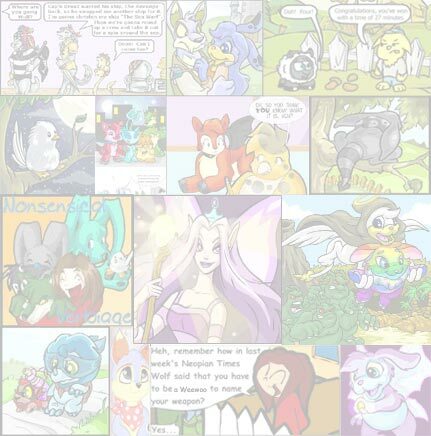 “NEOPIAN NED!!! !” Joey yelled at him. “I’ve been asking you to turn off the lights,” Joey replied with frustration. He just doesn’t know what gets into his friend, Neopian Ned, sometimes. They are great friends, but there are those times that he wants to take his little, green Koi fin and slap his friend awake! He watched Neopian Ned turn off the lights and they both fell asleep. The next day, as they were eating breakfast, Mr. Shankly, the pound director, came into the dining area. He had a very big smile on his face. Even before the end of the announcement, cheers erupted from the room. However, no one could have been happier about this than Neopian Ned! Three days later, Neopian Ned was waiting in line to get on the bus that will take them to the adventures. He didn’t think he’d ever make it to this day! But now, here he was getting on the bus! As he was looking for a place to sit, Joey caught his eye and motioned to the seat next to him. Moving toward the seat, Neopian Ned noticed a small crowd of pets gathering around Hartzie, a yellow Peophin. He stopped to see what the attraction was. “What’s going on?” Neopian Ned asked curiously. “Hartzie has a little book listing all the adventures!” Madeline, a blue Ixi exclaimed. A book of the adventures! Oh, Neopian Ned had to see that! So he crowded in with the others. Finally, it was his chance to read about the adventures. There was one about toothpaste! Oh and one about a lost Grarrl! There were even some adventures about battles, monsters and puzzles! Then he saw it! The adventure he knew was for him! ‘The Secret Detective's Ball’! It was all about detectives and a mysterious house and disappearing pets and heroes and villains! Plus, some of the creators of the adventures may be around today! He may get to meet Ms. Echo! Oh! He could hardly wait! “Come on everyone. Take your seats. We can’t get this bus moving until you are all seated,” Ms. Pop Tart, co-director of the pound, announced. All the pets took their seats and the bus began to move on down the road. Neopian Ned and Joey were discussing what they think will be in Ms. Echo’s adventure! “I hope there are giant snakes in there!” said an excited Joey. While the two boys continued their plans to defeat all the catastrophes they could come up with, several of the pets started to sing on the bus. A bit later, the bus pulled up to the entrance. From what the book said, once you enter, you choose your adventure and then you are transported there. “Oh, this is going to be so much fun!” Neopian Ned thought to himself. “…And don’t forget to come back here at noon for lunch…,” Ms. Pop Tart seemed to go on and on while Neopian Ned sat there. Why can’t we just go in already? “WAIT! LITTLE KYRII! NO! DON’T GO…!” yelled an old Cybunny. It was too late. Lights flashed! Neopian Ned was flying through a… hole? Tunnel? He couldn’t tell. He was spinning around so fast, that he couldn’t see anything clearly! THUMP! He hit the ground with a huge thud! Laying there for a moment, he tried to collect his thoughts. He felt like his tummy was still spinning. He knew he had to open his eyes, but he really didn’t think he could. A few more moments passed and he finally opened his eyes. Neopian Ned could not believe what he saw! He must have hit his head! He stood up and looked around! All around him were trees and bushes and… it was like a forest. But none that he had ever seen before! The colors were backwards! The trees had green trunks with brown leaves! And the grass was blue while the sky was green! The flowers had green tops and colorful stems! He decided to walk ahead a bit and see where he ended up. He noticed some birds flying overhead. But…they were flying upside down! “Oh!” Neopian Ned groaned as he closed his eyes again. It all made him so dizzy. No matter where he looked, it was all… backwards! He had a strange feeling that he wasn’t in Ms. Echo’s adventure. Actually, he suspected that he wasn’t in anyone’s adventure. He opened his eyes to look around again. He chose a tree, that had fruit growing on its trunk, and sat down under it. What was he going to do? What would Neopian Malone do if he was here? For the first time, Neopian Ned was at a loss with his hero. There were no snakes or giant boulders coming at him. There wasn’t any gold to get or damsels in distress. So what was he going to do? He was such a little Kyrii in a big, backwards forest! “.here doing you are What .Hello” said a little voice. Neopian Ned looked around. He saw no one there. “Who said that?” he asked. There was no response. “Here doing you are What” the voice repeated. This time, Neopian Ned realized the voice was coming from above him. He looked up to see who it might be. High on a branch above him, sat a little Harris like creature. It looked kind of like a Harris, but it wasn’t a Harris. Neopian Ned stood up and turned to face the little guy. “Ummm, ca… can you help me?” Neopian Ned stuttered. The little creature jumped down to a closer branch. He perched himself in front of Neopian Ned, just above his head. “?bad or good you Are” the little guy said. Neopian Ned’s hopes fell. He had no idea what this little guy was saying. How was he going to find out where he was? How was he ever going to get back home! Cloten just looked at him. Then he started to jump to another branch. He turned and pointed at Neopian Ned. Then he pointed forward and continued to move on. Neopian Ned did not want to be left alone in the forest anymore. So he started walking ahead, keeping an eye on Cloten and on where he was going. Soon, they were at the edge of the forest. He must not have been very far into the forest to begin with. When he looked ahead, he saw a small village. He didn’t recognize it at all. But then why would he? He remembered he was in a new place. Now on the ground, Cloten began walking across the meadow. Neopian Ned didn’t understand what Cloten said, but he guessed it was serious. They continued to walk quickly across the meadow.” Cloten was picking up speed as they progressed to the center of the meadow. Then he heard it! “RUN RUN RUN!” yelled Cloten. Neopian Ned didn’t have to be told twice! They both ran as hard as they could through the meadow. But it wasn’t fast enough! Suddenly, they both seemed to be falling! Actually, being pulled was more like it! Something was pulling them underground! Neopian Ned just closed his eyes because he knew he didn’t want to see any of this! Thwap! “GROOWWLLL!” Thwap! came from in front of him. Neopian Ned opened his eyes to see Cloten being carried off down an underground passage! Oh he couldn’t let this happen. Cloten was his friend, even if they hadn’t known each other that long. He saw that he was in some kind of cave. It was well lit with torches and it looked as if someone lived here. It would have been fun to explore had his friend not been in trouble! He got up and started to walk down the passage way. He had no trouble finding his way. It wasn’t as if he could actually miss the footprints the meadow beast left. He could hear the growling somewhere ahead of him. But it seemed that it was getting farther and farther away. Neopian Ned realized that he was going to have to run if he wanted to catch up! Neopian Ned felt something hit him in the back. The force pushed him forward until he fell. He turned to see what it was and noticed a thin block of wood swinging on a rope. He must have knocked it loose as he ran by. He pulled himself up and the block of wood started swinging faster. Oh No! It was going to hit him again! Neopian Ned ducked as the wood flew over him. For once, he was very glad he was small. He looked up and saw ahead of him, more ropes of swinging wood. He knew that he was going to have to be very clever to get past this! Dodging his way through, he stopped for a rest and to listen. He didn’t hear anything now, but that didn’t bring him any relief. He decided that he better continue on. He had to find Cloten. Keeping his eyes open, he kept watch for anything out of the ordinary. Alright, so this was out of the ordinary. But he meant ‘more’ out of the ordinary. Suddenly there was a violent shaking of the cave floor. Neopian Ned froze where he was. The shaking stopped just as suddenly. So he moved on a bit more before the shaking began again. This time, it didn’t stop! And the walls were shaking as well! Wait! They weren’t shaking! They were closing in on him! Oh he wished he was home! He broke out into another run and tried to get past where the walls were closing. He was almost through that passage way when he found himself pulled down again! He looked up to see the walls had closed together. Well at least he wasn’t still up there. Then he remembered that something had pulled him down. And last time this happen, it wasn’t a good thing. “Who’s there,” whispered Neopian Ned. “Ssssgrrrrrrr,” came a sound that Neopian Ned had a feeling he wasn’t going to like. It was darker in the pit than it was in the cave. Although, he could still see a little bit. And he could make out that something across from him moved. “Ssssgrrrrrrr,” came the sound again. Neopian Ned looked around and saw some light coming from one end of the pit. Unfortunately, he had to cross the path of whatever it was that was there. Maybe it was friendly and wouldn’t harm him. Then again, maybe not, Neopian Ned thought. “On your mark,” Neopian Ned thought to himself, “Get set… Go!” He ran towards the light as fast as he could! WHACK! he was knocked to the ground! That hurt! he thought again, OK, new plan. He got to his knees and slowly crawled to the light. A movement caught his eye! He stood up and sprinted to the light and through the exit! As he was leaving, he took a quick look behind him and then he saw it! Just beyond the beginning of the light, he could make out the thing! It looked to be a cross between a giant snake and a Krawk! He just kept on running until he had to stop for a rest. After a few moments, Neopian Ned started down another passage way in hopes of finding his little friend. He truly hoped this would take him in the right direction. BOOM BOOM BOOM!!! went another strange noise. “Oh, what now!” Neopian Ned moaned in frustration. He was tired and sore and hungry. Scared was in there some place too. But he knew he had to go on. He walked faster through the passage way in hopes to reach the end sooner. BOOM BOOM BOOM!!! went the loud sound again. From the sound of it, Neopian Ned was heading straight for it! But what choice did he have? Stealing himself for whatever was there, he went on. There seemed to be a bend up ahead. He slowed his pace and held himself as close to the wall as possible. Cautiously, he poked his head around the corner and then he had his first real glimpse of the meadow beast! And against the far was Cloten, sitting there in fear! “Oh what am I going to do!” moaned Neopian Ned. He needed to get Cloten out of there and get both of them away from the beast. But just how was he going to do that? He didn’t know the way out of the cave. And he certainly wasn’t going to go back the way he came! So what then, will he do? Trying to think logically, which is really hard to do under the circumstances, Neopian Ned assumed that there had to be a way in and out of the cave which the beast used. And obviously, since the beast used it, then it should be a safe way out of the cave. Now, how does he go about finding it? Oh if only he had some help! There it is again. His attention was drawn to something fluttering in the lair. He looked very hard and then he realized what it was! It was a small piece of fur! It was fluttering… in a breeze! Breeze! That meant there was an opening close by to cause the breeze! All he had to do was find it! He watched for the piece of fur to flutter again. If he could tell which way the fur was fluttering, then he could figure out what direction the breeze was coming from! There! He saw it! It was coming from an entrance to a passage way in the back of the lair! He thought for a moment and decided that it may be best to alert Cloten that he was here first. So poking his head a little farther around the corner, he tried to catch Cloten’s attention. But he had to becareful that he didn’t attract the beast’s attention as well! After a few seconds, Cloten looked over in the direction of Neopian Ned. The surprised look on Cloten’s face showed that he had seen his friend. Neopian Ned placed a finger to his lips to indicate silence. He braced himself against the wall and took a few moments to gather his courage. He didn’t know what was going to happen. He just knew he had to try. To see where the beast was, he took one last look around the corner. The beast’s back was to him. As quietly as he could, Neopian Ned moved against the wall. He thought it would be better to get as close to Cloten before the beast noticed. Inch, by slow inch, he moved closer. Then he had no choice but to cause a distraction. Taking a deep breath, he let out a blood curdling scream! The startled beast spun around to face him! Shocked by the intrusion, the beast just stood there for a moment! Taking advantage of this time, Neopian Ned made a grab for Cloten! Without a thought to anything else, they ran through the back passage way and kept going! Oh, the beast was angry, but Neopian Ned just kept a hold on Cloten and ran for their lives! He was getting scared because it seemed to be taking so long to get out of the passage! He could hear the beast behind them, screeching and growling! Then he could feel it! A breeze! They were heading in the right direction! Running, running, running! It’s so far and he is so tired! Just when he thought he could go no farther, he broke through to daylight! They were out of the cave! Neopian Ned kept his hold on Cloten as he ran farther and farther away! Finally, when they could not hear the beast anymore, Neopian Ned slowed down until he could stop completely. He sank to the ground, still holding onto Cloten. When he was able to catch his breath, he took a look around him. They were by some kind of a field. He had no idea where he was. However, Cloten seemed to know exactly where he was. Pulling himself from Neopian Ned’s grasp, Cloten pointed into the field. Then he pointed at Neopian Ned. “.home you take will field This” Cloten smiled. Neopian Ned didn’t actually understand what was said. But he understood the meaning. As much as he wanted to go home, he didn’t want to leave his new friend. "Come with me?” Neopian Ned asked hopefully. “.there is home your as Just Here is home My. Here stay I, No” Cloten replied, again pointing towards the field. Neopian Ned couldn’t remember feeling so sad and happy at the same time. He looked towards the field. He wondered how far he would have to walk to get back home. Then he handed Neopian Ned something. It was an odd shaped coin. “!friends forever are We” Cloten said enthusiastically. “Yes, forever friends, Cloten!” Neopian Ned returned. Both knew that it was time for Neopian Ned to find his way home. He took a last look at Cloten before he began to run through the field. Faster and faster he went! “!Ned Neopian for wish you what Becareful” was the last thing he heard his friend say. Neopian Ned opened his eyes just a bit. The faces he saw were blurred. He could hear voices, but couldn’t make out who they were. “Looks like he’s coming around,” said another voice. 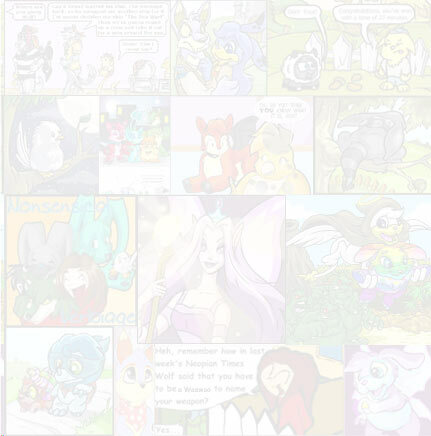 Neopian Ned’s vision started to clear and he saw the faces of the people he knew. He realized he was back at the adventures. Slowly he sat up and looked around. So many people seemed to be around him. He looked for Cloten but didn’t see him. Neopian Ned couldn’t believe what he was hearing. He didn’t faint! He was in the backwards world with his new friend! And he was held captive and fought a beast and he had the adventure of his life! On the bus ride back home, he sat quietly staring out the window. He couldn’t have imagined it. “Hey Neopian Ned… are you OK?? ?” Joey asked with concern. Neopian Ned shifted positions to look at his friend. That’s when he felt something, in his pocket, jab him. He reached into his pocket and pulled out an odd shaped coin. Turning the coin over in his paw, he realized that it was the odd shaped coin that Cloten had given him. “It’s just Ned,” he replied smiling to himself. Ned’s days of being an adventurer have come to an end. After all, when you’ve already had the adventure of your life, what more is there to adventuring? These days, Ned has a new hero to look up to and imitate… his dad. He was adopted into a wonderful family full of brothers and sisters. Plus, he has his own petpet. A Harris named Cloten. Author’s Note: I hope you enjoyed my story. Please feel free offer comments.